Off the blog train again, I know I know. One of these days I’ll get back into it. I haven’t taken many pictures lately, which is most of the problem. I started writing this three days ago. Oops. Things on the wedding planning front have been busy. We’re just wrapping up details and making some semi-last minute purchases. We purchased a good amount of artificial flowers in bulk (cheaper that way)—the cream rosebuds came with the fake water look (aka. HOT GLUE DOTS) ALL over the buds. Kinda tacky. So, I just finished cleaning the last bag of those off this weekend (aka. scraping millions of little glue dots off the buds) with the help of Delaney, who was part of “girl day” here. I have a garage full of wedding stuff (or, “wedding crap,” as my youngest brother likes to call it) that will soon be organized into categories based on where it’s going—kitchen/catering, reception, sanctuary, dressing room, for pictures, etc. And a bookshelf in my room full of stuff—but that is mostly categorized by shelf, so it will just need to be added to the appropriate box/pile when the time comes (that stuff can’t sit in the garage). Thankfully we have a HUGE collection of Macy’s boxes (they ship small stuff in LARGE boxes), so organizing should be relatively easy. Under all the “wedding stuff/crap” is a kitchen table and chairs that needs to go to John’s house (that I’m moving into). We’ve had it for a few months—but it quickly got consumed by wedding stuff. The hope is to be as organized as possible come the time Danielle gets here a few days before the wedding so she can help me make sure it all gets to the appropriate place. And so if/when I go bonkers looking for something she’ll know where it is. 🙂 haha-such a great MOH she is! My parents sent their piano to Cordele, so now we have MORE room for a table inside that I’ve already started filling with wedding stuff. It’s taking over the houseeeeeeeeeeeeeeeeeeee! But is oh-so-fun! We visited John’s parents & his sister Rachel’s family in Orlando this past weekend. 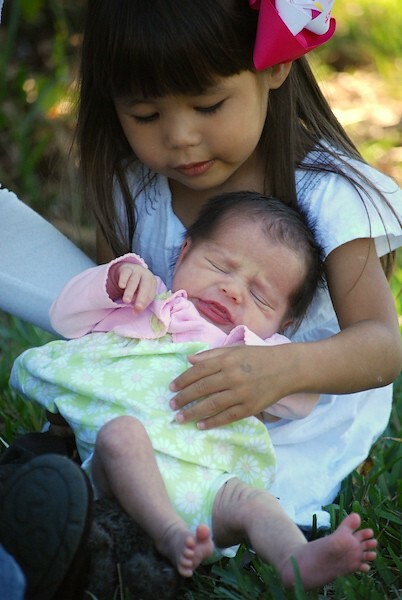 Scarlett and Juliette are two of her four kiddos (they have two new totally healthy twin girls–praise God)! It was so much fun! We also got to have dinner with Hollee. 🙂 Wish I had a picture of that. Bummer! Well, it’s Christmastime (yes, I know, that was a big “duh” statement)! We have endured winter weather around here (it was in the 30s! this morning–that’s COLD for South Floridians!). Thus, everyone is sick and full of sniffles. It’s quite lovely. The Christmas tree at my parents house, which sits next to-oh! surprise! wedding stuff! My mom has had fun displaying our place-settings and all the wedding-related invitations. I use the basket as a place to hold all of our cards. 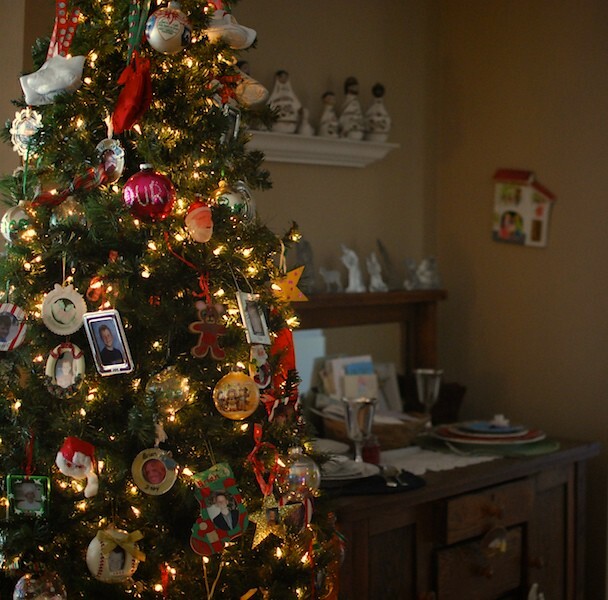 I looooooove decorating Christmas trees. My dad asked if I’m coming home every year to decorate the tree. Price refuses! A shot of the tree (and me!) 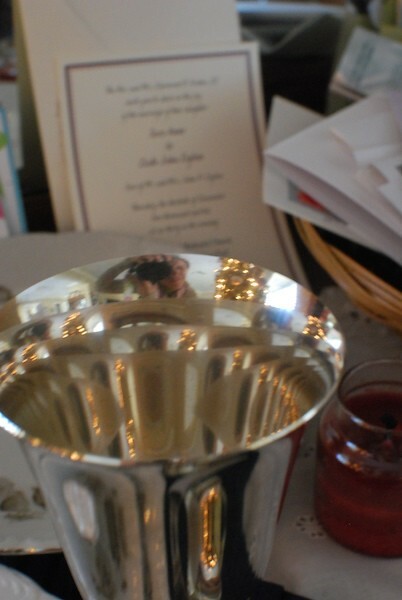 into one of our silver goblets–gifts from Grandmama and Grandaddy. They received them at their wedding. We are using them for the cake cutting/drink sipping (what’s that called?) part of the reception. And will love having them for the rest of our lives. Our fine china-from Granny and Grandpa. They received it from my Great Grandparents, so it’s really meaningful to us. So simple and beautiful! 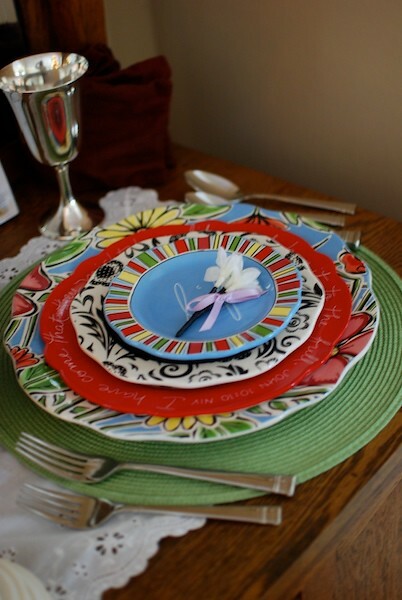 And our fun everyday china! 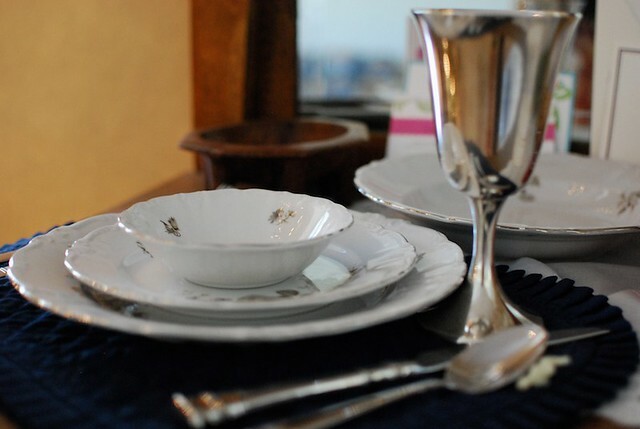 We’ve already starting using it at John’s house…along with our new silverware (it’s also in the pic above, just really blurry)! The large plates don’t fit in the cabinets (bummer), but everything else does. We have plenty, plenty, plenty of plates. The purple flower on the top of the plates was the boutonniere my dad wore in my parents’ wedding. We keep everything–actually, Grandmama does! haha. So, there’s a bit of an update.